Can You Burn Arm Fat When Hitting a Punching Bag? Flabby arms are unsightly and can be a real challenge to your personal confidence and self-image. It might seem logical that working out your arms — such as with punches to a heavy bag — would reduce arm fat. However, the truth is more complex and involves muscle toning and development. It is a pervasive fitness myth that exercising your arms targets your arms for losing fat. Instead, you lose fat when creating a negative calorie imbalance that forces your body to access the excess energy it has stored. That fat comes off the body as a whole. Although this does include your arms, a punching workout won't target your arms specifically for fat loss any more than would a leg or ab workout. Striking a punching bag is a vigorous resistance and cardiovascular workout. A 200-lb. person burns 510 calories in one hour of work on a punching bag, according to Panhandle Health District. This can help you burn enough calories to lose body fat, some of which will come off your arms. 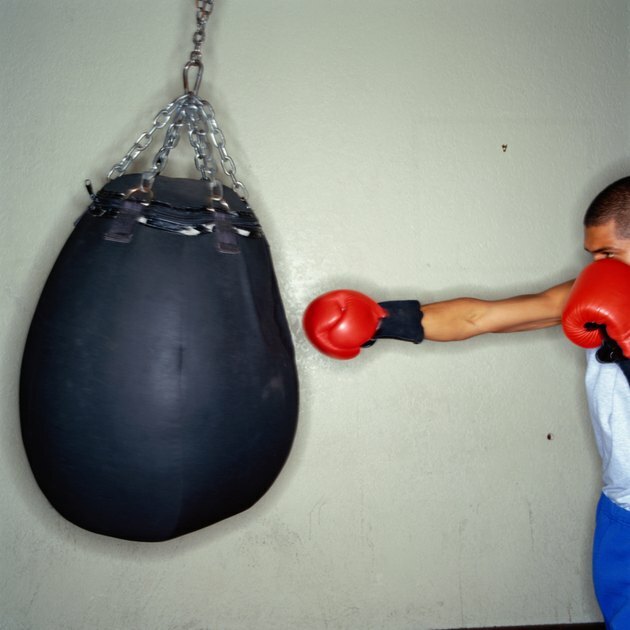 A workout on a punching bag — especially a heavy bag — does build and tone arm muscles. This tightens and firms the frame on which your fat hangs, which can give an illusion of immediate weight loss on the arms. This phenomenon is probably the reason that "spot reduction" — the idea that arm exercises promote fat loss from the arms — is such a commonly believed myth. Because it burns calories, punching a bag can help you lose body fat, including the fat on your arms. However, it's not as efficient a calorie burning workout as many other options such as cycling, swimming or running. If you want to burn fat, you may also need to support your punching bag workout with a calorie-restriction diet intended to help you lose weight.